Earthquake In Nepal 2015 – footsteps……..
NPR.org updated – Dozens of people in three neighboring countries were also killed. At least eight were reported dead on Mount Everest, and perhaps dozens more trapped by a quake-triggered avalanche that hit the world’s tallest peak at the height of the climbing season. 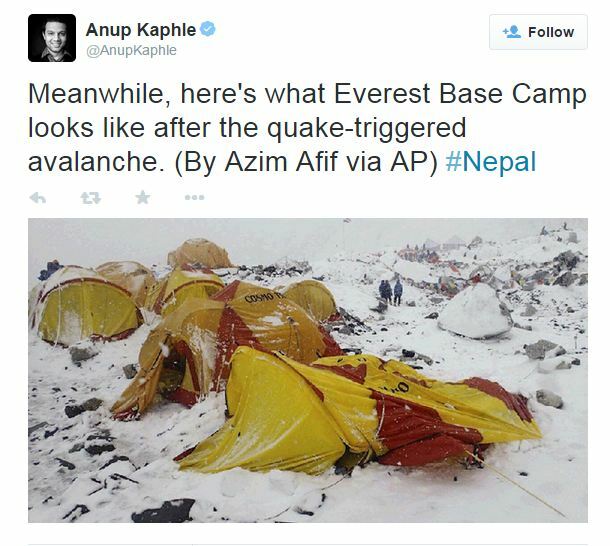 AP reports that a Nepali police spokesman says 1,394 people are confirmed dead in that country. At least 38 others were confirmed dead in neighboring India, 12 in the Tibet region of China and two in Bangladesh, according to the AP. The quake also triggers avalanche on the worlds highest peak, Mt Everest. The Weather Channel reports – At least 10 climbers and guides were killed, but more were injured and missing, and officials weren’t sure how many people were stranded on routes now cut off by snow. Numerous climbers may now be cut off on routes leading to the top of the world’s highest peak. The avalanche began on Mount Kumori, a 7,000-meter (22,966-foot) -high mountain just a few miles from Everest, gathering strength as it headed toward the base camp while climbing expeditions have been preparing to make their summit attempts in the coming weeks, said Ang Tshering of the Nepal Mountaineering Association.